On the morning of 3rd October 1918 HMS L10 was in the vicinity of a German convoy, which had, the previous night, been attacked by British Destroyers. That afternoon a number of German ships were spotted searching the area for survivors and L10 signalled her intention of attacking the German squadron, which consisted of the Destroyers S33 and S34 and two torpedo boats heading from Zeebrugge to Germany. S34 struck a mine with the result that the other ships were forced to ignore the danger of mines to rescue the sinking destroyer’s crew. L10 moved in and fired a torpedo at S33. S33 was severely damaged but initial thoughts of another mine were dispelled when L10’s conning tower broached the surface. 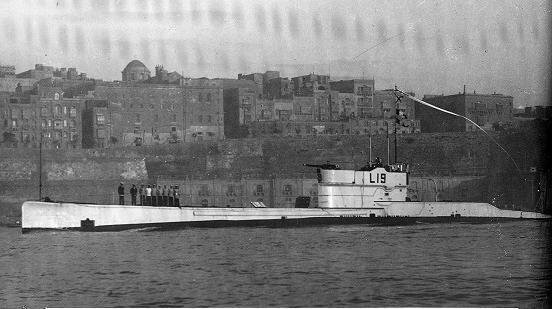 S33 managed to bring her guns to bear and sank the submarine through persistent shelling." BTW: you might want to contact the Archives at the RN Submarine Museum about this man. Interests:Railways, Motorcycles, Computers, Target shooting. I can't help you with L10 but I have several photos of other L class. Here's L19 of 1919 at Malta in 1929. Interests:Royal Navy activities and personnel from the Victorian era to post WW II. There were no survivours from L 10. I have the complete casualty list, if helpful. Thanks everyone for the excellant information. I have had a look on the web today and found that the S33 sank as a result of the damage it received at the hands of L10. Just to confirm from the casualty list my man is Leading Telegraphist J/21375 William Frampton Baker. This is the L 10 casualty list. Was in contact with a Dutch shipwreck museum a few months ago; the wreck of L10 has not been located to date to the best of their knowledge. Many thanks again, that's my man at the top of the list. Do you know what the (ch) after his number means? Do you know what the (ch) after his number means? this indicates that your man signed up at Chatham . I found a site that says the L10 was built HMS Dockyard Pembroke, and launched in January 1918. Where is HMS Pembroke? and is the launch date about right? It's HM Dockyard Pembroke, Wales not HMS Pembroke. WALSH FESTY STOKER 1c K 30492 (Ch) L 10 04/10/18 SHIP LOSS, was one of my relatives who died the L10. I don't know much about him and was wondering would there be any pictures of the crew somewhere out there. Son of Clifford George and Sarah Baker, of 3 Hurst Cottages, Station Rd, Limpsfield, Surrey. Killed in action with T.B.D., in North Sea. Chatham Memorial is open 0830 - 1700. For entry Telephone Guard Room at Brompton Barracks, 01634 - 822442. HMS MAIDSTONE. ADM 188 / 689. AG 1396 / 18. P.o.B ; Wandsworth, London. Occ ; Office Boy. Note ; dates of service are in reverse order - 180215 = 15 February 1918. L.10 Advance Party - he was first of crew to arrive Denny's Yard to take over the boat (after the initial `stand-by-buiiding' crew). Killed in action with T.B.D. in North Sea. HMS MAIDSTONE. ADM 188 / 927. AG 1396 / 18. P.o.B ; Clifden, Galway. Occ ; Waterman. Note ; servuce dates are in reverse order - 180605 = 05 June 1918. Note also that he volunteered from HMS Royal Oak - probably fed up with service in a great `battlewagon' doing nothing, sitting in Scap Flow. The book "Benneth the Waves" dealing with RN submarine losses has an account of L10s loss. I have been looking for a Photo of L10 for some time ,with no luck , i am interested in Samuel James Hutchings ,if i find a Crew or Submarine photo i will let you know. Son of S.J. Hutchings of Heath Hills, Folly Gate, Inwardleigh, Okehampton ; husband of Elizabeth Halstead (formerly Hutchings), of Frankland Farm, Sampford Courtney, North Tawton, Devon. HMS MAIDSTONE. ADM 188 / 659. AG 1396 / 18.P.o.B ; Exeter, Devon. Occ ; Butchers Boy. Here is a pic of L10, unfortunately I cannot remember the source of the photo. Photo and info is Great ,Many thanks for help . My Great Grandfather Frank Eyres served on the L10 as a chief stoker. Sadly he also lost his life on this submarine, but I do have a photograph of him and some of his colleagues. Unfortunately there are no names on the back of the original photo but if anyone is interested I would be happy to post a copy of the picture into the forum. Hello EyresF. Yes, please post the picture of your GGFather on the Forum. All I think will be pleased to see it / him. Son of John and Elizabeth Eyres ; husband of Louisa Kate Eyres, of 30 Brookfield Rd., Portsmouth. HMS MAIDSTONE. ADM 188 / 459. A.G 1396 / 18.P.o.B ; Salisbury, Wilts. Occ ; Labourer. His FULL RN Service Record ADM 188 / 459 may be obtained from PRO/NA `on-line' for £3.50. There are no LOGS for C.35 / D1 for the dates he served on the boats. Likewise no Logs for E.19 as she was, at the time, in the Baltic. For info on her at that time I suggest you contact DARREN BROWN - most knowledgable in that subject. Logs are mostly for navigational purposes, but do also give other info at time - Lt ??? joined ship / Sto ??? injured in E.Room. as Sadsac mentioned, i do have a lot on your man, i have sent you a Personal Message so i can help you. What a very special relative you have, he was one of five men from E19 who was selected to be awarded the Cross of St George in November 1915, and the special part was his medal was pinned personaly by none other that Russia's Last Czar. The remainder of E19's crew got their Crosses in June 1916. If you still have his Cross, priceless is all i can say. But many men sold these Russian Awards. Also got Several Photos of him.